Lake Callide Retreat is open! 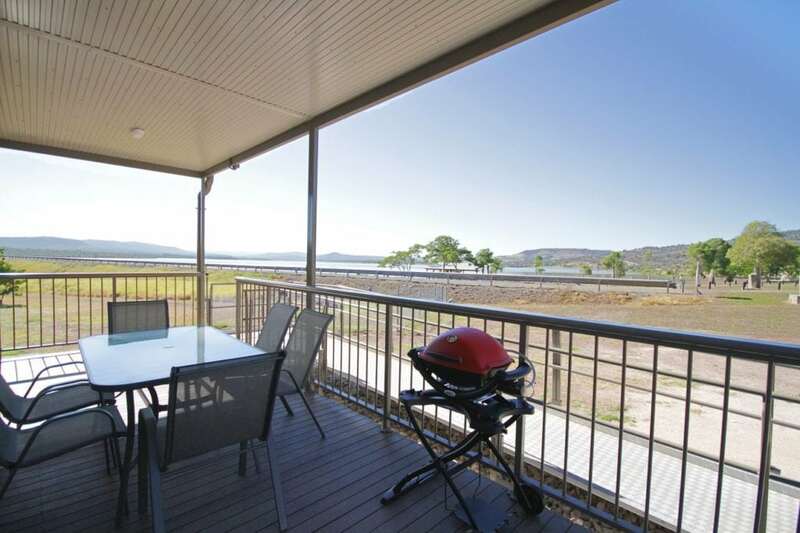 Now you can swim, play, fish, eat, relax, AND sleep, at the popular Callide Dam location. 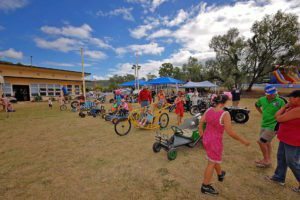 The Callide Dam, found just to the north of Biloela in the Sandstone Wonders region, has long been a favourite recreational destination for locals and visitors alike. 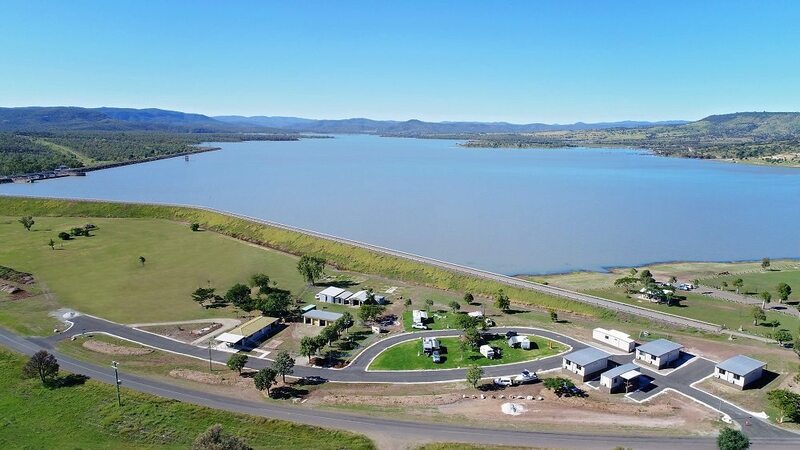 The opening of Lake Callide Retreat (in July 2017), adjacent to the recreation area, means visitors can now enjoy the dam and all its attractions right on their own doorstep. And at the end of a fun-filled day at the dam you won’t have to pack-up and head back into town to find a bed for the night. Lake Callide Retreat is operated by Banana Shire Council. 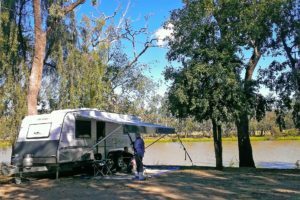 Affordable lakeside accommodation options include 5 self-contained cabins, powered sites and camping sites – all located just a stones throw from the water. One cabin is suitable for mobility impaired people to provide easy access. 1-bedroom cabins contain one queen size bed; 2-bedroom cabins contain a queen size bed, and three single beds. Fold-up beds are available for extra guests at as nominal fee if required. 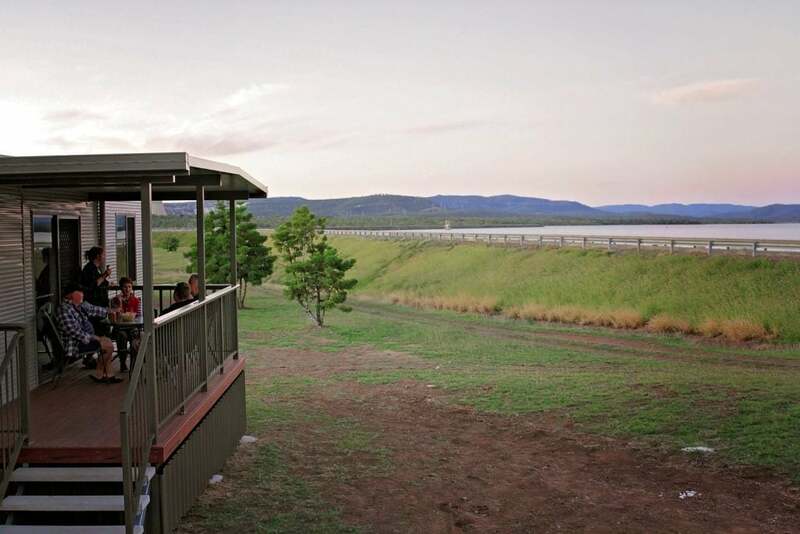 All cabins contain a kitchenette, full bathroom (with shower), reverse-cycle air conditioner, a Weber Q (BBQ), a verandah, free Wi-Fi and four have expansive views across the Callide Dam, with the other boasting rural views. For caravaners there is power, water, a shared ensuite bathroom and a caravan waste point, with great rural views and less than 100m away, expansive views of the dam and free barbecues. 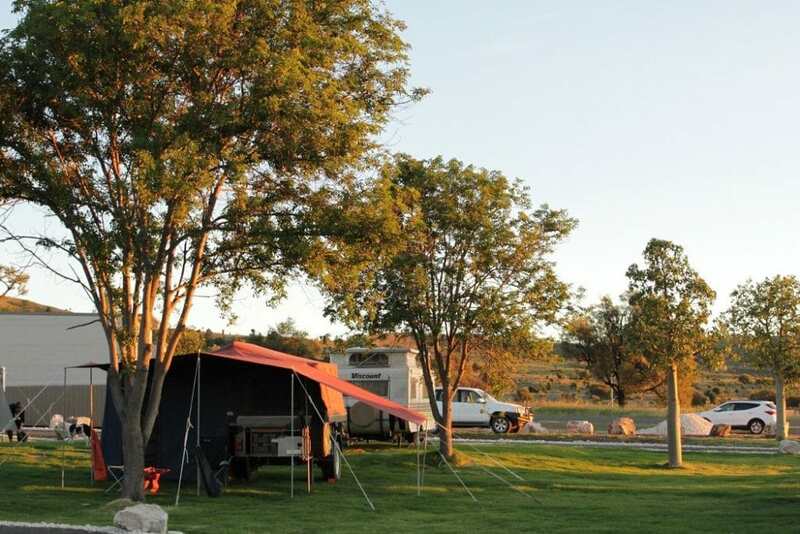 Our low cost option for self-sufficient campers boasts rural views with open space, a water point and waste point. Recreational activities are the main draw-card for visitors to the dam. It’s a great spot for a BBQ, picnic, a game of cricket, to throw a football, or simply watch the sun go down. 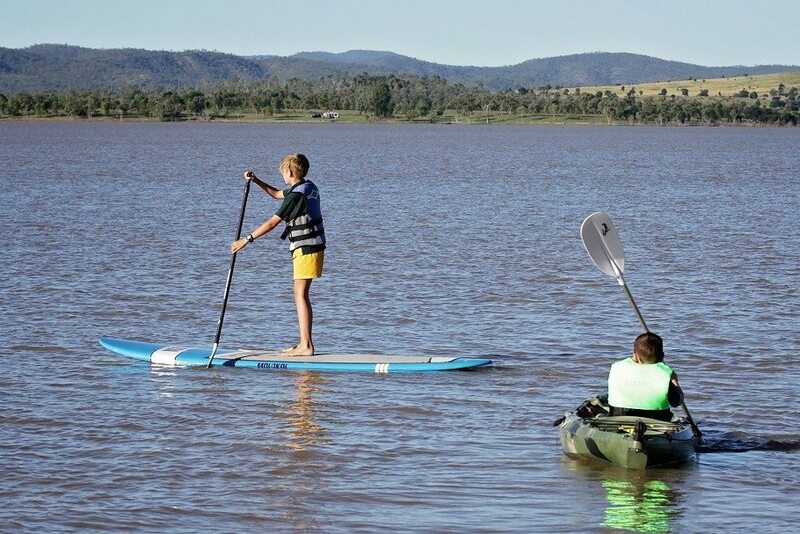 New activities available include kayaks and stand up paddleboards (SUPs) for hire. Alternatively, throw in a line and catch your own dinner. Fishing is also a very popular activity at the dam, and keeps both young and old guests happily entertained for hours. 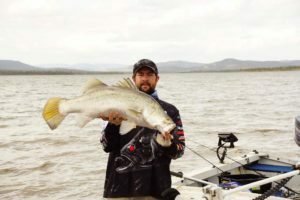 The dam is stocked with sleepy cod, saratoga, golden perch (yellowbelly), silver perch and barramundi; and has a large red claw population. The dam is also home to a wide variety of birdlife, including resident pelicans which are a great drawcard for children to watch. The on-site kiosk provides hot and cold drinks, snack food and ice creams; as well as hiring out fishing and red claw gear, kayaks, and stand up paddle boards (SUPs). The kiosk is open during the day only. The retreat may mean you never want to leave – and with the fish biting well, why would you want to leave? 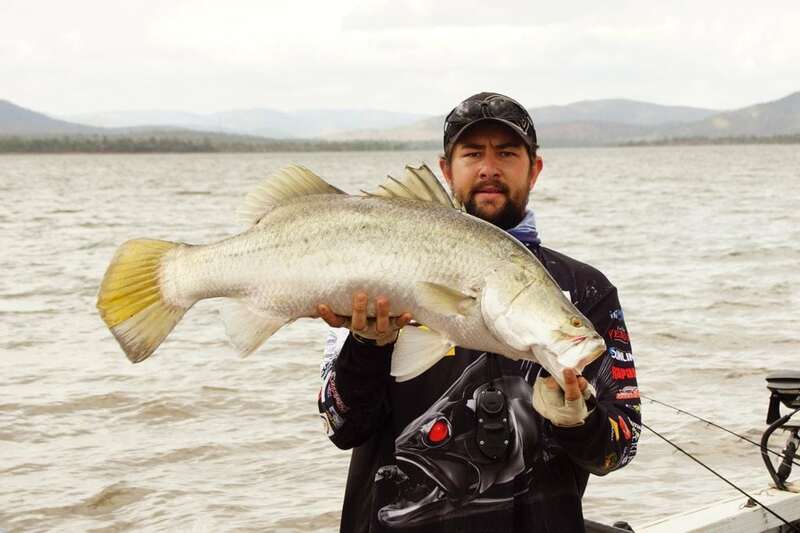 Make sure you book well in advance though, especially during school holidays – and for the upcoming Callide Dam Family Fishing Classic competition (held in October each year). 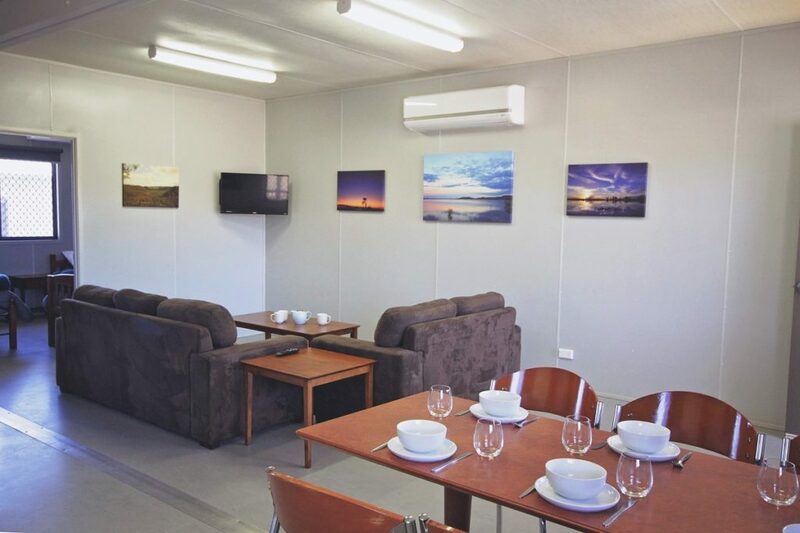 Accommodation rates start from $7 per night for self-sufficient campers, from $20 per night for a powered site; and from $120 per night for a cabin, during off-peak periods. Bookings for Lake Callide Retreat can be made by: email to caretaker@lakecallideretreat.com, the Lake Callide Retreat Facebook page, or call (07) 4993 9010. And you can visit their Instagram page. Constructed in 1965, the Callide Dam was built as the source of cooling water for the nearby coal-powered Callide Power Station. The dam can hold 136,700 megalitres of water; has a surface area of 1,240 hectares at full capacity, and has an average depth of 10.5 metres. A second stage of the dam was completed in 1988. 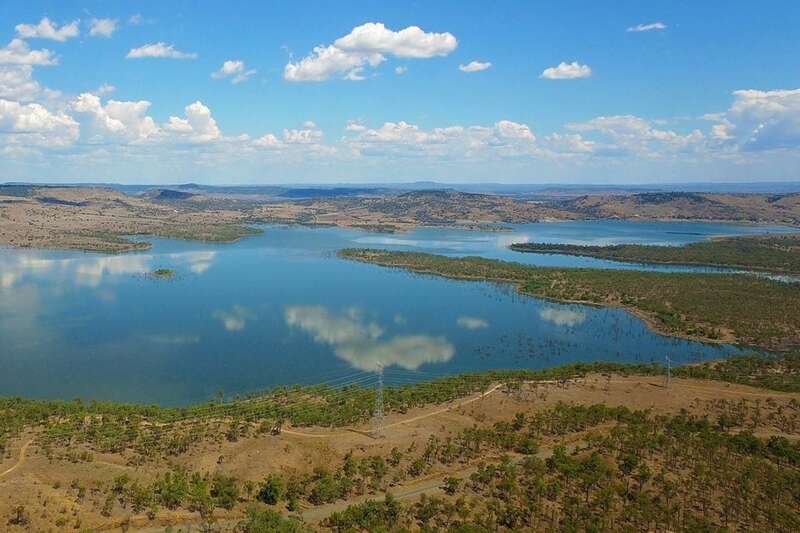 Banana Shire Council draws water from the dam for the township of Biloela, and provided to customers in the Callide Valley via underlying aquifers. For more information about Callide Dam visit the SunWater website. 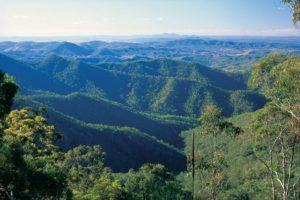 While staying at the retreat, make sure you head into Biloela to check out the local sights. 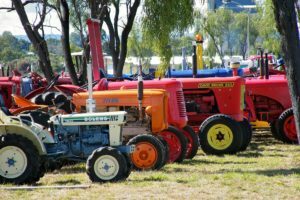 If you’re keen on local history, head to the Queensland Heritage Park on the outskirts of Biloela, or Greycliffe Homestead. 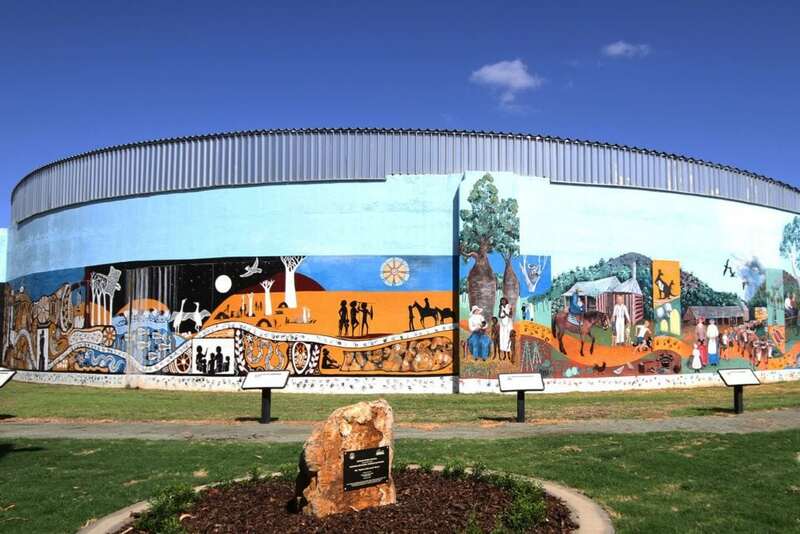 In town visit the Banana Shire Regional Art Gallery, and the stand-out attraction – the ‘Spirit of the Land’ Mural, the extraordinary local water tower painting that has become the town’s iconic landmark. The detailed mural tells the story through the eyes of two local women and cultures, artistically recreating the connections between the early pioneers and the Indigenous people. 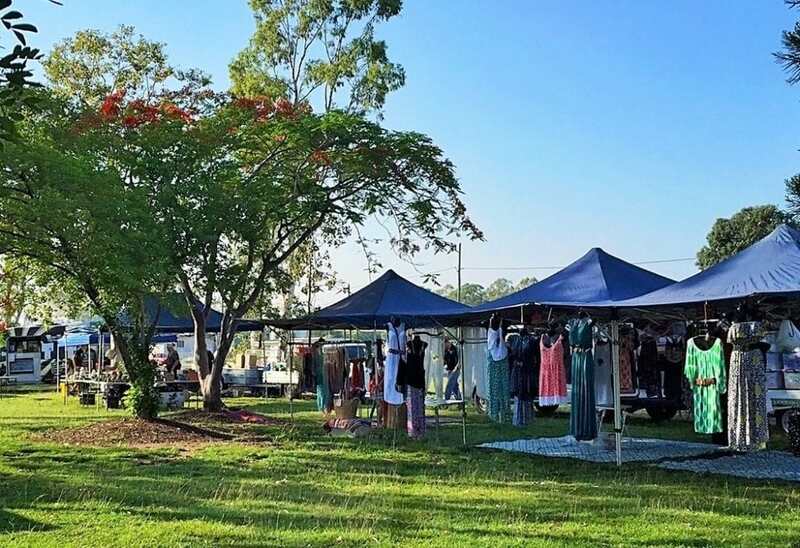 If you are in town on the 3rd Saturday of the month, don’t miss the Biloela Markets – where you’ll find locally-made arts and crafts, jewellery, and fresh home-made baked goods and farm produce. Check their facebook page for current details or the events section on the Sandstone Wonders website for dates and other local events. 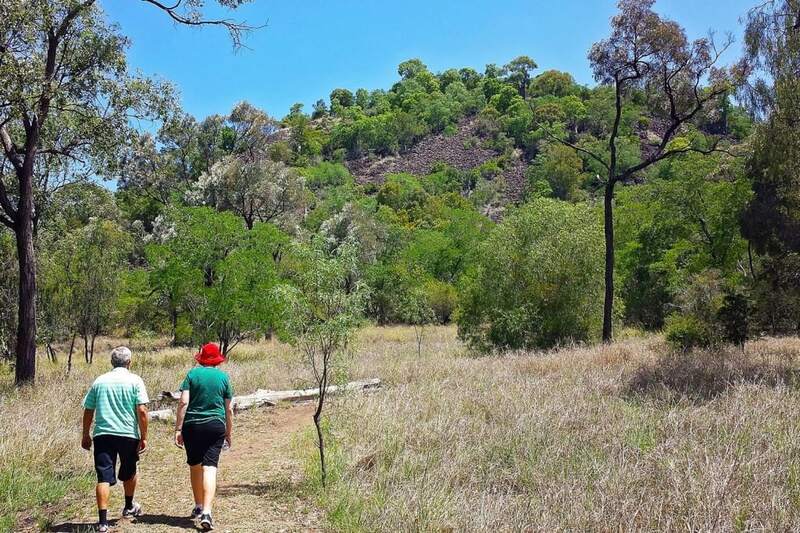 Just out of town near Thangool is Mt Scoria Conservation Park, known as the ‘Musical Mountain’ by locals. It is so-called because the ancient volcanic rock resonates and makes a humming sound when struck together. The unique volcanic pillars were formed when the lava flow cooled naturally many millions of years ago. For more details download the Sandstone Wonders regional brochure. And to keep up-to-date on regional news and events, please check out our Facebook page.